Kristin and I went to Connecticut to watch the Superbowl and spend time with my family. We met Shayna for the first time. 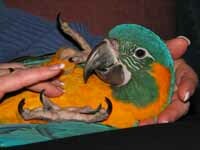 She is a five month old Blue Throated Macaw. P.S. The Giants won the Superbowl. My dad was very, very happy.